The Tarot trump for Gemini is The Lovers VI. The esoteric title of the trump is Children of the Voice: Oracle of the Mighty Gods. The ‘voice’ is the expression of the Gods called Chokmah and Binah on the Tree of Life, also known as Chaos and Cosmos or the Beast and Babalon. The 17th path of Gemini is the seventh from Aleph. The letter zain (or zayin) is the sword separating the waters of the Firmament of Nu into the twin streams of time and space. According to Kenneth Grant (Typhonian Trilogies), the sword of zain is the ‘S’ word (s-word), the word of the serpent or fire snake. The 17th path of Gemini and The Lovers expresses the resolution of duality through the uniting of all oppositions. It is the creation of the world and its magical recreation through the Great Work. The 17th path of Gemini connects Binah, the sphere of Saturn, with Tiphereth, the sphere of the Sun, and is imaged forth by the Tarot key The Lovers VI. The path is called the Intelligence of Sensation or the Disposing Intelligence. It is also called the Foundation of Tiphereth in the plane of the Supernals—since its root is in Binah and its termination in the centre of the Ruach. The idea of ‘sensation’ derives from agitation, stirring or seething (ha-regash)—the sword of intellect is much troubled by the dualism inherent in its own nature, yet it is this turbulent state of affairs that is necessary before any Great Work can begin. The agitation of the sword of zain is only calmed when the meaning of every phenomenon is understood. Ultimately, when every phenomenon is clearly perceived then, in the words of the Oracle ascribed to Zoroaster, “After all the phantoms have vanished, thou shalt see that holy and formless fire, that fire which darts and flashes through the hidden centre of the universe; hear thou the voice of fire”. 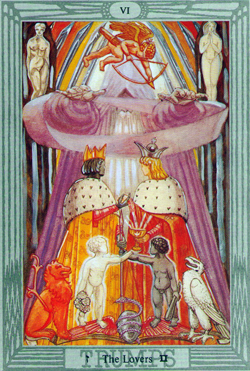 The duality of Gemini, the 17th path, is in alchemical terms expressed as Sol and Luna, depicted in the imagery of the Tarot trump as the Alchemical Wedding presided over by Hermes or Mercury. The instruction concerning the three forms of light, Aub, Aur and Aud, as posited by the Hermetic Order of the Golden Dawn, requires correction. The Order’s teaching identified the phallic light of Aur with rational consciousness, the ‘light of solar day’. In fact, the sun’s power waxes and wanes through the year in the same way that the moon waxes and wanes over the course of one month. It is the interweaving of the twin serpents, the dual light of Aub, that produces phenomena. The ‘fixing of the volatile’ is when the phallic pillar of the Aur light arises in the shushumna or middle pillar in the occult anatomy. The fluctuations of the twin serpents, Sol and Luna or Ida and Pingala, are stilled or ‘slain’ by the will to Silence; the Aur light then returns consciousness to its source, the Aud or Starlight of Nuit. The magical power of the 17th path of Gemini is the Power of being in two or more places at one time, and of Prophecy. This entry was posted in Astrology, Qabalah, Thoth Tarot and tagged divination, Flaming Sword, Gemini, magick, mythology, occult, Thelema by admin. Bookmark the permalink.